Heinrich Bunting was a professor of theology at Hanover. His primary work is entitled, 'Itinerarium sacrae scripturae, published in 1581. It contained woodcut maps that included a world map (Cosmographia Universalis), as well as another world map in clover form. Other maps included Europe as the queen of the World and Asia as a winged horse. 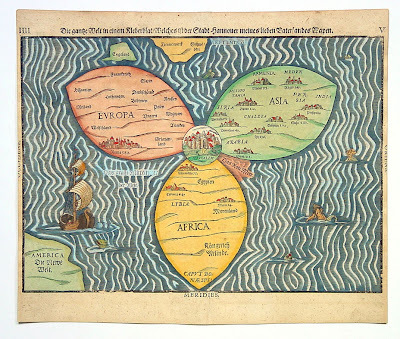 Heinrich Bunting (1545-1606) knew the world didn’t really look like this. 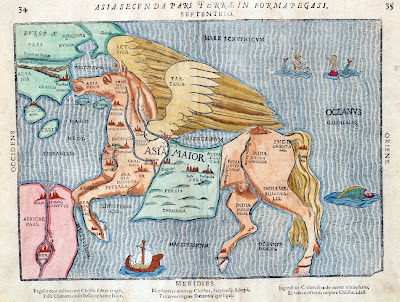 There are enough maps in his works (such as Itinerarium Sacrae Scripturae) to indicate he knew the continents had an irregular, and not a symbolic shape.Yet he delighted in drawing other symbolic maps, examples of which can be anthropomorphic (Europe as a virgin) or hippomorphic (Asia as a winged horse). This particular map is a tribute to Buntings hometown Hanover, as the text above the map indicates: Die ganze Welt in einem Kleberblatt welches ist der Stadt Hannover meines lieben Vaterlandes Wapen (‘The Whole World in a Cloverleaf, Which Is The Coat of Arms of Hannover, My Dear Fatherland’).The map shows a world divided into three parts (Europe, Asia and Africa), connected at a single central point: Jerusalem. This is essentially still the same symbolic map of the world as the one first devised by Saint Isidore in the seventh century. Isidore’s ’T and O’-shaped map, itself inspired by Scripture, influenced Christian European mapmaking up until the age of discovery. Just found out that "Welschland" in the European part of the map is a French-speaking part of Switzerland. This is a modern nick-name but the region fits geographically quite good between Milan and Rome.